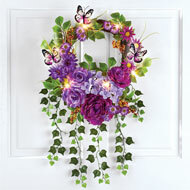 Lighted Color Changing Skeleton Wreath from Collections Etc. $16.99 $8.97 Save up to 47% Now! The creepy skeleton in the center features color-changing, lighted eyes and is surrounded by a full, black mesh wreath with sparkling glitter and leaf accents. Requires 3 "AA" batteries (sold separately). Hook on back. Iron, polyester and plastic. Approx. 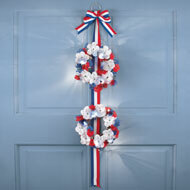 18"L x 32"H.
THINK THE PRODUCT FOR HALLOWEEN WILL BE VERY NICE ON FRONT DOOR AND GOOD DETAILS ON THE SKELETON RECOMMEND PEOPLE TO BUY THIS THANK YOU - MIDWAY1919, BARNEGAT ,N.J.
On/Off Switch doesn't work properly. As above I wanted it to work right and I could not do it after many try's. - norman jacobs, Metairie La. 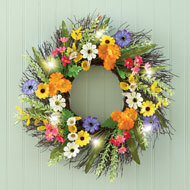 Bright colors and lush greenery make this wreath a wonderful addition to your home. 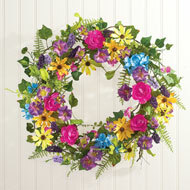 It features yellow daisies accented with pink, purple and blue flowers, delicate ferns and twining ivy. Hook on back for hanging. Polyester, plastic. 21"Dia.